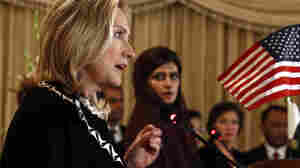 Secretary of State Hillary Clinton speaks in Islamabad Friday, as Pakistan Foreign Minister Hina Rabbani Khar looks on. 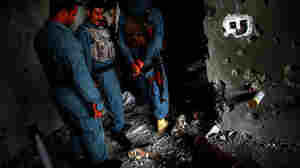 Clinton urged Pakistan to act swiftly to dislodge the militant Haqqani network. October 21, 2011  Secretary of State Hillary Clinton, in Pakistan to urge the country's leadership to eliminate safe havens for terrorists, says that U.S. officials met with the Haqqani network this summer. She did not say who the participants were, or what was discussed. 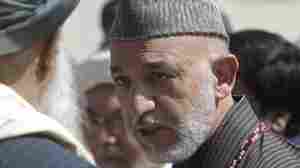 October 5, 2011  Two weeks after the assassination of a former president, Afghan intelligence officials say they have disrupted a plot to kill the country's current leader. 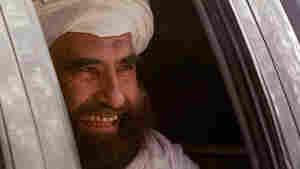 In this archive photo from October 21, 2001, Jalaluddin Haqqani smiles as he leaves after a meeting with Jama"at-i-Islami leaders in Islamabad, Pakistan. October 3, 2011  Ahmed Rashid, correspondent for The Daily Telegraph, Ayesha Siddiqa, author of Military, Inc., and former Pakistani ambassador to the U.S. Mahlia Lodhi explain who the Haqqanis are, and how they're connected to Pakistan's Inter-Services Intelligence Agency. September 28, 2011  Anonymous Obama administration officials tell The Washington Post that the Joint Chiefs chairman overstated the ties between Pakistan's government and terrorist networks. An aide to Mullen says he "stands by every word of his testimony." September 22, 2011  The chairman of the Joint Chiefs of Staff says the Pakistani government "actively and passively" supports groups that have been behind attacks in Afghanistan. 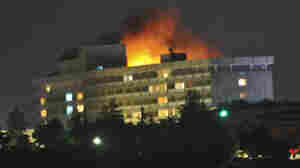 September 14, 2011  "This was clearly the site of a huge fight," NPR's Renee Montagne reported from the scene. And the under-construction building offered a clear line of sight to the U.S. embassy. No Americans were injured during the attack. June 30, 2011  The airstrike that killed him came on the same day the Obama administration unveiled its new "National Strategy for Counterterrorism," which focuses on targeted drone strikes and special operations raids rather than conventional wars.